NCIPM Recruitment 2018 01 Senior Research Fellow Vacancy Apply through Official website www.ncipm.org.in. NCIPM invites Walk in Interview for appointment in following Senior Research Fellow (SRF) post in Indian Council of Agricultural Research. 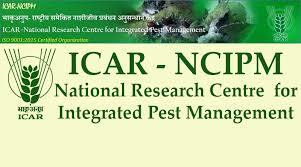 Candidates are requested to Download Application through Official website www.ncipm.org.in. other Details Like education qualification, age limit, selection process, application fee & how to apply, important links, syllabus, admit cards, results, previous papers are given Below. Age Limit: Age limit for Senior Research Fellow is 35 for Men and 40 years for Women. 2. The age is relaxable for SC/ST and OBC candidates for SRF, applicable as per NCIPM/Govt. of India norms.